Experiment with screaming balloon rockets! Use Solar Glasses! Construct and use a Star Finder! 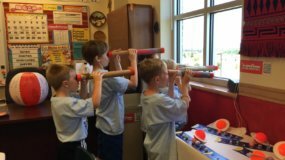 Build a Telescope! Build and launch an airburst rocket! Create a glow in the dark model of Saturn, design a UV bracelet, build a sun dial, model our solar system, and so much more!